Books are powerful portals to the very stuff of life. Books are collections of leafs (single sheets) with each side called a page. The pages begin as empty horizons with no boundaries of sky nor land nor imagination. People put thoughts and ideas and images and precious things on and between pages of books. Magical marks, drawings, symbols, stamps, or collections of writings, illustrations, or blank, lined, or gridded sheets are collected and bound into books. Pages are ordered in their collection and are joined on one side to keep that order. The joining of pages can be stitched, glued or stapled. Now we have digital books produced and available electronically called e-books. Before books were invented, people wrote things in the dirt on the ground, with scratches on wood, clay tablets, papyrus or cloth. It wasn’t until the Gutenberg Printing Press was invented in 1447 that book binding became more important. There are many different ways to bind a book as well as many different uses for books. Visit your library and ask to look at the rare book collection. You will be surprised to find books that are older than anything in your city! Think of how this book was passed from generation to generation and from city to city to travel to the library in your city! Leave your story in the world. Make a book! Visit this glossary of book terms if you need some help! 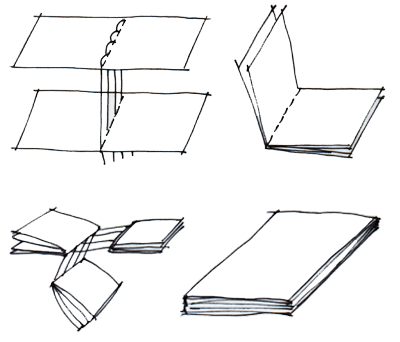 Although there are many different ways to bind a book, each one has similar parts. For example, the pages of a book are called the signature, and the cover is called the board. The binding is used to attach the signature to the board. The binding is the most important part of the book and is also most varied in different types. 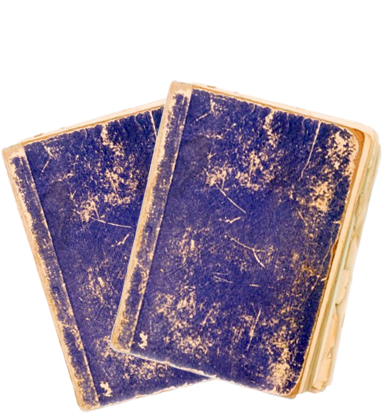 Some books have exposed bindings which allows one to see it while the book is closed. The materials used in the binding can also change how it looks and works. Some bindings are simple while others are complex. But their functions are all the same. The binding of a book is usually determined by the book’s content. A textbook might have a different type of binding than a portfolio or a personal journal. Visit a library and see how many different binding techniques you can find in the shelves. Ask the librarian to see some rare books on a subject that interests you. Find out which one you like, and make a book! Take a look at the books in your house. See how many different binding examples you can find. Look until you can find an example of each of the following binding types. Make a list of binding types in your journal. 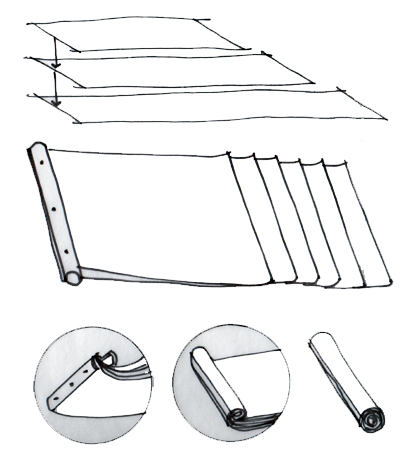 Diagram each of the following binding types by using the resources. The design of the cover of the book is very important. It catches our eye, raises our sense of curiousity, and invites us to explore further. Design of a book cover can include design of the front cover, the binding (what is visible when on a shelf), and the back cover. Think of one of your favorite stories. Create a book cover or book jacket that would entice others to read the story. Choose scenes from the chapters or create a graphic or pattern that communicates the emotional content of the story. Think about what font the titles should use. Think about the size of the authors’ name. Cover your book with your artwork. A book is a sequence of spaces. Collect some of your sketches, photographs or your writings into your very own book. 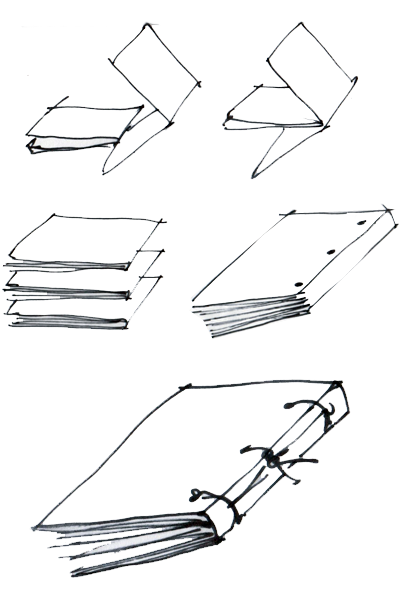 Consider the following binding types - stitched, folded, butterfly, signature, etc. Experiment with inserting different kinds of paper. Consider covering your book with cloth or fabric. 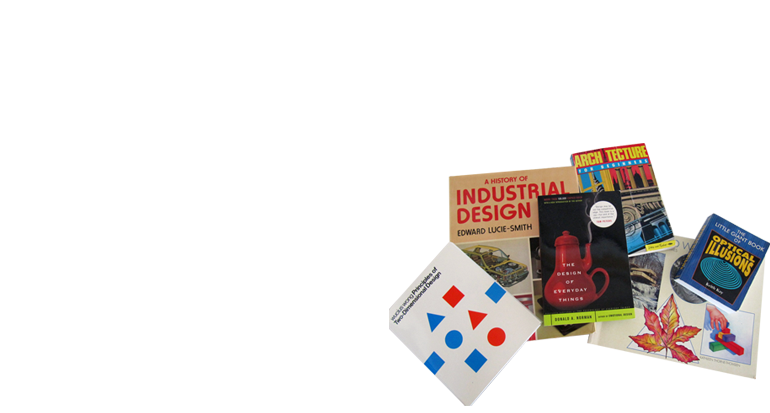 Check out the resources, and choose a book binding type. Create a book of your own art work. Pick a theme, a story, or daily picture making. Try different media like ink, watercolor, pencil, or cut paper collage. Spend time with your book. Create a book of your own art work and give it as a gift to a friend or a family member. Leave your story in the world! Signatures are pages in a book. Which Chinese binding became so popular that it ended the scroll and started the folded leaf book? The Galileo Press was the first printing press invented.
. Scrolls were early forms of books. ISSUU Publish your book online! Video TEDed Plate Tectonics Pop Up Book! Video TEDed What makes a book a book?